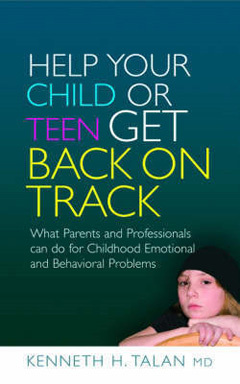 Help your Child or Teen Get Back On Track: What Parents and Professionals Can Do for Childhood Emotional and Behavioral Problems offers specific self-help interventions and a wide-ranging, practical discussion of the types of professional help available for a child or adolescent with emotional and behavioral problems. The book covers topics that would be discussed during a consultation with a child psychiatrist. The first section offers practical guidance and ideas to help parents understand their child's problems and learn to distinguish between normal disruption and that which warrants professional treatment. The second section of the book includes useful information for those parents who are considering, seeking, or already involved with professional help for their child. Essential reading for parents who are worried about a child or adolescent with emotional and behavioral problems, Help your Child or Teen Get Back On Track: What Parents and Professionals Can Do for Childhood Emotional and Behavioral Problems is also a useful resource for social workers, psychologists, school counselors, pediatricians, and adult psychiatrists.